In Spain, an appetizer, called an entremése, is a complement to a meal while a tapa is something altogether different. Although an entremés can be the same little food that a tapa is, it is served differently. It is literally the appetizer coming before the first course. Tapas, on the other hand, are not appetizers. They are tiny plates of food served in bars all over Spain to accompany drinks. Tapas are not so much a kind of food as a Spanish way of eating. Strictly speaking, they are an Andalusian way of eating because Andalusia is truly the home of tapas. It seems as if any kind of food can be a tapa, so long as it comes out of the kitchen of a bar on a small plate. A step into a Spanish tapa bar is a wonderful experience even if you don�t speak Spanish. It�s lively and animated as Spaniards like to talk and you may be approached by patrons wishing to practice their English. Spaniards go to tapas bars before lunch and before supper to meet friends, to converse, and to watch. It�s hard to think of a tapas bar as an eating establishment because it functions more like a trysting establishment. Conversation ranges from the mundane to the philosophical, and the food ranges from the simple toasted almond to the complex callos (stew). You will be able to taste snippets of a huge variety of foods just as you would hear snippets of conversation perhaps about the lottery, bullfighting, the local team, or the local politics. Tapas are never served at home or in restaurants. Spaniards, when not enjoying a home cooked meal, will leave their homes as evening descends to spend a night out with their friends. They meet first at tapas bars, where they may bar hop, eating and drinking different tapas before they settle into their restaurant for the evening. The word tapa means lid. It was thought that the plate acted like a lid on top of the mug or glass (to keep out dirt, dust, and insects) in bars that originally offered food, probably to attract customers. Anna MacMiadhach�in, in her Spanish Regional Cookery, speculates that they are a legacy of the Arab presence in Spain, when, she says, the serving of alcohol was forbidden except with food. This explanation doesn�t make too much sense because the Koranic prohibition against alcohol was total. On the other hand, Muslims were drinking wine over the ages in spite of the prohibition as we know from the centuries of delightful poetry in Arabic about the glories and virtues of wine. Although tapas might have roots in the Arab era, they are today not philosophically related to the similar seeming meze of the Near East. Tapas, unlike meze, are not meant to replace dinner. Tapas can be grouped into three main categories, according to how easy they are to eat: cosas de picar, pinchos, and cazuelas. Cosas de picar (meaning �things to nibble�) basically refer to finger food, the most famous being the olive-the quintessential Spanish and, in fact, Mediterranean finger food. If a utensil (like banderillas, decorated toothpicks that get their name because they look like the darts used in a bullfight) is required to eat the food, the tapa is called pinchos. Cazuelas (little dishes) are tapas that usually come in sauce, for example, alb�ndigas (meatballs) or shrimp fried in garlic. All regions of Spain have tapas, although Catalonians have not traditionally eaten tapas and do so now only because of the unification of modern Spain. The Catalans were gastronomically closer to the French and Italians than to the Spanish. The Basques call their tapas pintxos from the Spanish word pinchar, to prick because they were once always served with toothpicks to pick them up. The Spanish proverb comiendo, comiendo el apetito se va abriendo--appetite increases with constant eating, might give you a better idea of what lies behind the culinary experience of Spain. In Spain, tapas bars are called tasca and it is difficult to convey the exuberant liveliness of a tapas bar because they are not just about drinking wine and fine sherry and not just about eating little foods. A tapas bar is more a window into the Spanish soul and the Spanish gastronomic mentality. They are egalitarian places where people of all classes will congregate. Children are welcome. 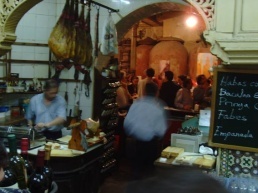 Tradition has it that the art of tapas had its beginning in Andalusia.